The World BRMConnect Conference is coming up quickly. Held in New Orleans October 7-9, this conference is the only global educational event held by BRMs, for BRMs. In anticipation of BRMConnect, we look to standout BRMs from across the globe to gain insight into how they’ve successfully leveraged a BRM capability. This week, we aim the spotlight on Jeremy Byrne of the United Kingdom. Jeremy holds the position of IT Business Partner at Loughborough University. As a firm believer in business relationship management’s ability to drive value, evolve culture, and build partnerships to satisfy purpose, Jeremy successfully provides value to almost every corner of his organization through a BRM capability. Specifically, he progressed maturity of the BRM capability within Loughborough University, expanding the team and reach of the function. Jeremy promoted BRM Institute to hundreds of new BRMs in the UK via LinkedIn, growing awareness and adoption of BRM best practices. Additionally, he became an accredited trainer in BRMP® and CBRM®, achieving a 100% exam success rate with those under his tutelage. When asked what characteristics of a successful culture BRMs bring to an organization, Jeremy points to empathy. He firmly believes that empathy is the single most important trait needed by organizations across the globe. Thus, by bringing empathy to the forefront of people’s minds, BRMs help others understand what drives people and processes; contributing together for the greater good. By practicing transparency in all that they undertook, Jeremy and his team communicated a unified vision across Loughborough University. This evolved the university’s culture to one of shared ownership and an increased understanding of purpose. What does a perfect reflection of shared ownership of strategy and results look like to you? Jeremy focuses on implementing high-level strategy to guide Loughborough University in the direction of shared ownership across functions. Thus, when he attended BRMConnect, he was inspired to an even more strategic focus through his specific learning track. Afterward, he applied this knowledge to drive even more value throughout his organization. In order to provide a universally valuable experience to BRMs like Jeremy, BRMConnect offers five different learning tracks. 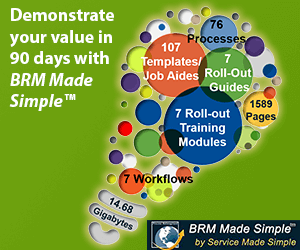 Each track is specifically designed to meet the needs of BRMs in any industry and across all functions. Thank you, Jeremy, for all that you do promote the future of business, through business relationship management. We look forward to seeing you advance your BRM capability further at this year’s World BRMConnect Conference.